leather care has been a perennial question from readers, so this is what i did when i got my MG bag. it's a pretty easy leather care method that simultaneously conditions and adds a bit of protection. my care method consists of two parts: waterproofing and conditioning. a room with good ventilation/windows, some tissue paper to lay out over the floor or treatment area, Collonil waterstop spray, Collonil leather gel, and a clean soft cloth (i have a stash of these that i can re-use and machine wash). 1. lay the bag flat, and spray the bag evenly with a coat of waterstop spray. wait about 20-30 minutes for it to dry, then repeat with another coat. 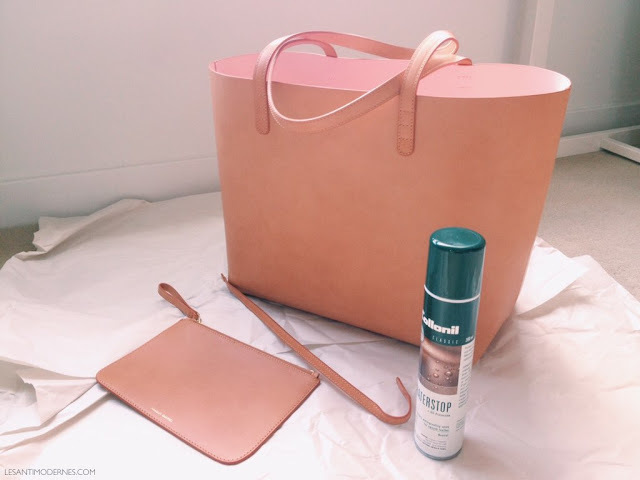 don't freak out if you see the spray darkening the leather on contact; it will dry cleanly and invisibly. 2. let the bag dry completely in a well ventilated, preferably sunny spot by a window for at least several hours, or overnight. 3. add 1-2 pumps of leather gel onto the soft cloth. start with a small area (the underside of the bag is a good place to start) and gently buff the conditioning cream into the leather until absorbed. continue to do this for the rest of the bag and straps. let dry completely. 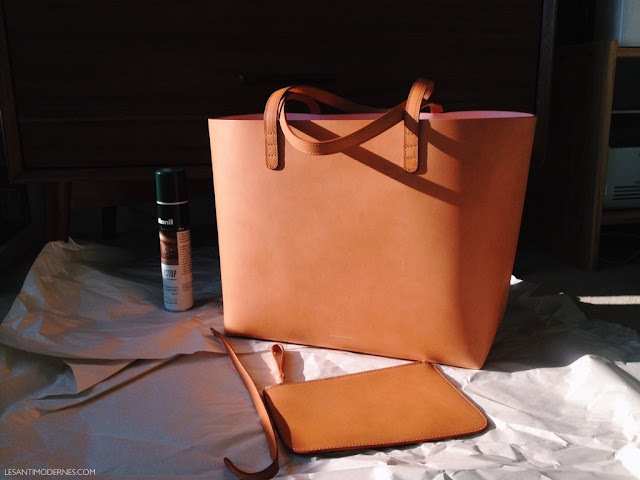 4. when the bag is dry, take the cloth and do a final round of gentle buffing all over the bag. this will leave the leather with a nice, glowy sheen. some people say you don't need to do anything, but i prefer to do this basic two-part leather treatment just to give the veg tan leather some extra love before use. wear will still show, and the leather will still organically darken and evolve with time. the simple conditioning will be my occasional cleaning/moisturizing method as the bag wears in. do you have a leather care/maintenance method for MG bags, or other untreated leather goods? please share your tips and experiences! Ohhh, so waterproofing first, then conditioning? I'd been doing it the other way around. I too was surprised to read that you do it in that order. But then I guess in the long run, when you're re-conditioning and re-waterproofing leather, you're going to condition on top of old waterproofing and waterproofing on top of old conditioning. I tend to do more harm when I try to care for leather. I haven't conditioned or waterproofed my bags, and yet I always do with my shoes. It's odd, because I invest more in a good handbag than I do shoes. Maybe I should start! it's funny, isn't it? not all bags need some extra TLC, but it's nice to know a few good methods to take care of them.